An amazing video capture of a mothership releasing dozens of orbs and then dancing with them was taken on May 22, 2009 at about 5:40 pm in Mexico City. Pedro Hernandez was riding a bus, noted the display, and quickly got off the bus to get a better quality film capture. Per the Zetas, this extravaganza is moving into a new phase in the UFO sightings saga. ZetaTalk Comment 7/11/2009: This is a valid capture of a UFO extravaganza. The intention was to create a display that could NOT be doubted or debunked. Single orbs are debunked as balloons, or candles sent aloft, or water drops on the camera lens. This can hardly be any of those. Mexico was chosen as the site because it is discussing UFO sightings on major media, unlike the US which is deeply suppressed. This extravaganza is announcing a new phase in sightings. No more gentle hints. We're here. Stop the denial. Still photos cannot capture the drama playing out on the video. The mothership spews dozens of orbs from either side, then dances with them. A GodlikeProduction message board thread on this subject quickly revealed a range of attitudes about UFOs. 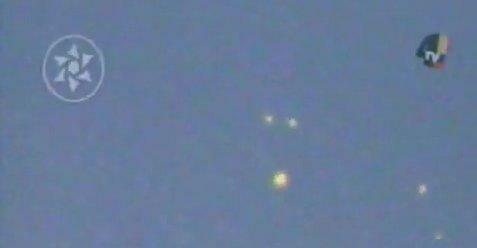 Most thought the video impressive, putting to rest any doubts about UFOs in general. But others had their defenses ready. The familiar religious claim that aliens are not intelligent beings from other worlds, but demons, appeared. Almost comic was another approach, to deny that intelligent creatures from other worlds exist at all, while refusing to be bothered with the facts. There are no UFOs, they are demonic. Here to hurt us. I will be repeating this refrain until the moment I am raptured and you all are left to believe or not believe and take the chips where they fall. They seem to be getting bolder and brazen and coming into human view by the thousands, in broad daylight! I haven't watched the video. I'll watch it at some point. It is not an extra-terrestrial craft. It's from planet earth. An economic downturn, such as the essential economic depression the world is currently experiencing, can be measured many ways. In human terms, it can be measured in increased homelessness, in increased welfare roles, and in job statistics. Despite recent efforts to reduce the number of chronic homeless, those mentally ill or struggling with addictions, by providing government funding for housing, homelessness has increased on all fronts. The most dramatic increase was among homeless families. Several years of progress in reducing the number of chronically homeless people ended last year, a study by the Department of Housing and Urban Development shows. While the numbers of individual homeless people remained relatively flat, the number of people in families that were homeless rose by 9 percent from Oct. 1, 2007, to Sept. 30, 2008, the report found. The report released Thursday showed that 1.6 million people lived in transitional housing or in a shelter in 2008, slightly more than in the previous year. But families now make up about one-third of that number. The report also found that the percentage of homeless people who used residential programs in suburban areas increased to 32 percent in 2008 from 23 percent in 2007. 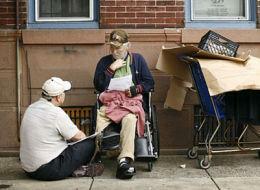 The face of homelessness has changed, due to foreclosure and job loss. Single young women with young children are on the increase, as is homelessness in rural and suburban areas. The stereotype of a single male, an addict, living in a large city like LA still predominates, however. The stereotype of a homeless person as a single man no longer applies. Although the number of homeless individuals remained relatively stable between 2007 and 2008, the number of homeless families rose 9 percent, and in rural and suburban areas the number jumped by 56 percent, according to a report released last week by the Department of Housing and Urban Development. In real terms, homelessness is still concentrated in urban areas and among adult males; 20 percent of all homeless people live in three cities: Los Angeles, New York and Detroit. Women comprise 81 percent of adults in homeless families, according to the report. And unlike homeless men, who are usually middle-age, homeless women tend to be young - under 25 - with children under 5. Rural and suburban areas were particularly ill-equipped to cope with the new wave of homelessness. And many of the states that experienced the largest increases in homelessness are predominately rural. In Mississippi, the number of homeless increased 42 percent last year; in Wyoming, 40 percent; Montana and Missouri, 23 percent; and Iowa, 22 percent. Welfare recipients have increased dramatically, as unemployment benefits run out in a poor job market. Twenty-three of the 30 largest states, which account for more than 88% of the nation's total population, see welfare caseloads above year-ago levels. As more people run out of unemployment compensation, many are turning to welfare as a stopgap. The average monthly welfare benefit in 2006, which reflects the most current data collected by the government, was $372. Statistics on job growth in the past 10 years show that the job situation in the US would have been far worse if government spending and personal deficit spending (maxing the credit card), had not occurred during the past decade. This offset the decline in manufacturing jobs which were shipped overseas. Between May 1999 and May 2009, employment in the private sector only rose by 1.1%, by far the lowest 10-year increase in the post-depression period. Basically speaking, the private sector job machine has almost completely stalled over the past ten years. Without a decade of growing government support from rising health and education spending and soaring budget deficits, the labor market would have been flat on its back. After the pole shift, most survivors will be homeless. Even if warned and prepared, the pole shift will be devastating to existing housing. Homes will most often have to be rebuilt from scraps - a covered basement or a raised section of roof used as a lean-to. Tent living will go on for some time during this process, and where migration is occurring, will be the mode. The Zetas have pointed out that migrations are almost endemic after a pole shift, and will be increasing as the Earth changes begin to devastate the Earth even before the pole shift. ZetaTalk Prediction 4/15/1999: You will find human populations beginning to migrate. These migration not only happens in cases of severe starvation, such as in northern Africa south of the Sudan, where people just stumble like sticks in any direction, looking for food, but also occurs when things get bad enough, when crop shortages are bad, and people begin to wander. They're looking for something better. So you will have migrations and you will have guards against migrations. Rifles at the border, pointed and saying don't come a step further and shooting people for little reason. This is already starting to raise its head in the anxiety that the United States expresses about the people south of their borders. How will survivors cope with this degree of homelessness after the pole shift, the inability to feed those who were unwilling or unable to prepare, who are on foot and without land or gardens or flocks and herds to feed themselves? Migrating hoards will in the main be turned away, but for many, spontaneous group formation will be the route to successful Aftertime living. ZetaTalk Prediction 12/6/2003: Distraught and frustrated at trying to convince family and friends that preparations for what seems to be surely upon mankind must be made, many wonder how they can join with others to enhance their survival possibilities when no one will listen. Denial hardens the more a threat makes those in denial uncomfortable. Thus, the worse the situation becomes, the more obvious the impending crisis, the more those in denial shout loudly that nothing is amiss. Unabashed advertising for group formation brings a horror to the door: scam artists, clinging dependency looking for a parent to lean upon, and those who have nothing to offer and everything to gain from association with others. Will everyone sincerely trying to join with others to form communities find they are standing alone, waving a flag, in the last days? Some communities, remote and rural, will continue essentially as they do today, perhaps with fewer individuals due to death from shock during the shift, but with the same basic political and economic arrangements. Distribution of goods and services will adjust to deal with the goods and skills available, and life will go on as before. Newcomers who drift into such communities are likely to find themselves rebuffed, as the known is far more reliable and comforting than the unknown from a stranger. Thus, strangers wandering into such communities find themselves moving on, having been made to feel distinctly unwelcome if not encouraged at gunpoint to do so from the start. Though widely unreported and discretely secretive, many people in cities or operating in the professions have sought to arrange settlements for themselves and friends or others of a like mind. It is reported that NASA employees have established monolithic dome communities for themselves, co-workers, and extended families. Those with connections to the elite have been rumored to have burrowed into rock in Alberta and the Ozarks, well stocked enclaves. Due to the number of untried relationships, which invariably hold surprises, these planned communities rarely work out. Hidden agendas, personality quirks, and attempts to dominate the group tend to fracture such arrangements, and there is a parting of the ways. 3. waterworld living, where a boat or houseboat is constructed or located and coastlines traveled. The electromagnetic disturbances the Zetas had predicted would arrive due to the charged tail of Planet X wafting the Earth caused more than the crash of Air France 447 into the Atlantic on June 1, 2009. Another Airbus went down off shore from Yemen on July 3, 2009, this one with suspicious electrical problems. The child survivor of the Yemenia jet crash which killed 152 today spoke of her ordeal as she flew back to France for an emotional reunion with her father. Bahia Bakari told a French government minister that she felt something 'like electricity' before the crash. 'She says instructions were given to passengers and that then she felt something like electricity, as if she had been a bit electrocuted. And suddenly there was this big sound. She found herself in the water. The flight recorder is unlikely to be found, as it has been separated from the ping signal device which was located. There is, thus, no means by which the recorder can be located in the ocean. The plane went down in high winds, but there no lightning was reported, and in any case lightning in and of itself will not cause electrical problems. The Airbus 310 was clearly flooded by an electromagnetic pulse, causing the plane to lose control and plunge into the sea, just as Air France 447 had done. Why just the Airbus? Is there something about its structure that makes it susceptible? Indeed there is! Having worked for the Boeing company for 36 years and now retired I have gotten some information about aircraft manufacturing, although I was never involved with the production aspects. The item I am familar with which you may find interesting regards the theory of redundant systems. Boeing aircraft are still designed with a redundant mechanical-hydraulic link which gives both pilot and co-pilot manual-hydraulic control over wing leading edge, and wing flaps, as well as rudder steerage in the event of electral-electronic failures. Approximately 15 years ago Airbus went over to a fly by wire control system, which would infer (but no guarantees) that in the event of an absolute electrical-electronic failure neither pilot, nor co-pilot could regain control over moving wing surfaces or rudder control. I believe it is this reason, that after the loss of the Air France crash, the Air France officials were threatening to ground all their airbus planes. Although the root cause of the crash was supposed to be altimeter misreadings, reading between the lines would suggest there is a lot more than what was stated. In summary it would appear folks on Airbus manufactured aircraft would not stand a very big chance of survival when caught up in areas of great electromagnetic anomalies. On July 8, 2009 another train crash occurred under similar circumstances to the DC Metro commuter train crash on June 22, 2009. Automatic signaling systems controlled the train, as had been the case for the DC Metro. One train (Pink) had disabled its system in order to back up onto another track. But the oncoming train (Purple) would not have disabled its system as it was moving forward. The pilot of the oncoming train frantically attempted to reverse just ahead of the crash but was killed. It appears that the monorails were approaching the end of their operating day and that Monorail Pink was attempting to reposition itself to go back to the monorail barn for the night. Since the collision system is reportedly disabled during track switching, there would have been no automated warning. The monorails have a fail-safe system called MaPo that prevents two trains from getting too close to each other, and actually applies emergency brakes if a driver tries to continue through a warning. However, both trains had had to override their MaPo warnings as standard operating procedure for the maneuvers that they were attempting to undertake. In addition to the fail-safe automatic warning and stopping system (MaPo) there were other redundant systems in place that would have prevented the accident that occurred. Moments before another train traveling backward slammed into the front of his vehicle and killed him, Walt Disney World monorail pilot Austin Wuennenberg apparently attempted to avoid the collision by throwing his train into reverse. The fatal crash was the result of a failed attempt to transfer a train between tracks, though the agency (NTSB) said it has not yet determined what errors caused the accident. But it also said it has found no "anomalies or malfunctions" with any track-switch components or with the automatic anti-collision system onboard all of Disney's trains. The roughly 400-word NTSB report offers the first official account of how the two trains collided. 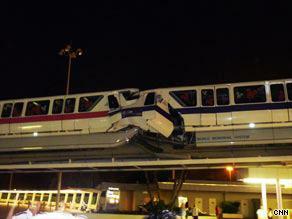 It was the first fatal accident in the 38-year history of Disney World's monorail. Not having someone at the central console would not be enough to cause the accident by itself, according to former monorail pilots. For instance, workers in the monorails' maintenance shop, who are supposed to activate track switches upon request from the coordinator, have their own display grids as well as monitors linked to video cameras that overlook the track switches - and emergency-shutdown switches. Former pilots said there also would likely have been multiple clues for the unidentified pilot of the second train that his vehicle had not shifted onto the spur line and was instead moving back down the Epcot line. And at least one individual on the Transportation and Ticket Center platform, near where the trains collided, should have had a portable "kill pack" that could have shut down the electrically powered monorail track had the person realized a train was coming from the wrong direction. This is likely to be yet another incident where a temporary electronic malfunction cannot be proved or disproved. But such incidents will only increase as the writhing charged tail of Planet X wafts back and forth over the Earth. One tourist said about an hour before the collision he heard about some technical difficulties. "After coming from the park, there was a bit of a delay. So we waited patiently. We didn't quite understand what happened. But they did say they were having some troubles with the monorail at the time. At any given time, there must be at least two holdpoints between a given train and the train ahead of it. When the train detects there are fewer than two holdpoints between itself and the preceding train, the emergency brakes are immediately applied and cannot be released until sufficient spacing becomes available, or the operator explicitly overrides the system. Per the Zetas, both Airbus electronics and the wireless signaling systems used by trains are and will be increasingly vulnerable in the days to come. ZetaTalk Overview 2/16/2008: Mankind's electronics are not braced for the continuous barrage that it is about to receive. If a charged cloud can create a surge or brownout in an electrical grid on the surface of the Earth, what can it do to electronic communications temporarily in the air? Wireless communications are very vulnerable, in the days to come.